« Photo shows the new tidal creek at the FISH Preserve in Manatee County. The first phase of the restoration project at FISH Preserve in Manatee County has been completed. The FISH Preserve is a 95-acre area located next to Sarasota Bay east of Anna Maria Island on the south side of Cortez Road. FISH is an acronym for Florida Institute for Saltwater Heritage, a non-profit organization that purchased the property in 1999 to help restore, conserve and protect the estuarine ecosystem and adjacent waters. 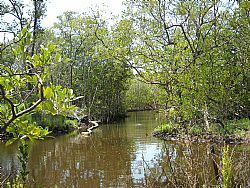 The initial phase of the restoration project involved mangrove restoration, the removal of exotic plants, and the development of a design plan. A number of bridges have been constructed to connect hiking trails. Kayak trails have also been developed for greater public access and to increase tidal flow. Many area schools have already visited FISH Preserve as a field learning site. Future restoration will focus on additional removal of exotic plants, the development of more kayak trails, and the development of two stormwater retention ponds. The SBEP and the US Fish Wildlife Service are funding the project. Scheda Ecological has been contracted to complete construction on the site. Other organizations involved with supporting the FISH Preserve Project include: The Audubon Society, The Ocean Trust, West Coast Inland Navigation District, The William and Marie Selby Foundation, Manatee County Board of Commissioners, The Organized Fishermen of Florida, First America Foundation, and the entire membership of FISH. Since its inception in 1989, SBEP has been involved with more than 200 projects related to habitat or water improvement within the Sarasota Bay watershed spanning Sarasota and Manatee County. A dozen projects are currently in planning, permitting or construction phase.